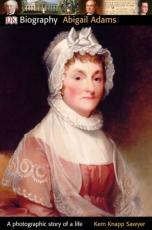 "Kem Knapp Sawyer ... brings the courageous, resourceful Abigail Adams out from the shadow of husband John Adams, illustrious Founding Father and second president of the United States. As a strong-minded New England girl, Abigail relished political and philosophical chats with the lawyer friend of her sister's suitor and so began one of this country's great love stories. Sawyer takes readers through the early years of the Adams's marriage, revealing both the condition of women in the late 18th century and the colonists' growing dissatisfaction with England. Then, with John forging a new nation and away for years, Abigail ran their farm, raised the children, helped with the war effort and wrote letters reminding her husband to "remember the ladies" when developing new laws."